A little bit of me: Health and Fitness - Yes I exercise, and here is why! Health and Fitness - Yes I exercise, and here is why! This blog post comes as a launch for a series of monthly posts about fitness and dieting that I will be writing under the supervision of Jeff Hanna*. 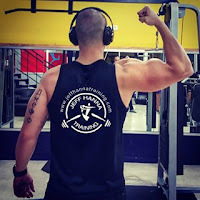 Jeff is one of the best personal trainers I have worked with and my fitness mentor for the past year. He is known to work with complex cases and has a vast experience in fitness training, body building, injury recovery, healthy dieting and dancing (oh yes! We’ll be posting about dancing too!). Highly motivational and full of positive energy, Jeff has taken his student to places no one has expected to reach before (moving lazy me to the gym regularly is the biggest proof of all!). Now let me tell you why I exercise! After all who doesn’t want to live long? And what’s better than living longer and healthier with full energy and full strength? Training gives your bones strength, promotes heart health and reduces disease risk related to age and bad lifestyle habits. It also helps control blood pressure and helps your body naturally secrete the Growth Hormone (GH) which is known for its anti-aging benefits. That’s a simple equation: when you exercise you sweat. When you sweat your body produces a hormone that makes you feel good. Let’s keep it simple and call it the Happy Hormone. The Happy Hormone makes you feel happy (like its name indicates) and more energetic! Now to be honest, I’ve read a lot that exercising works as an antidepressant, reduces anxiety and stress and makes people feel relaxed and happier. I’m not sure if I’m feeling better because of the results I’m seeing in the mirror and feeling in my daily life, or because of the hormones my body is now generating. But who cares? I’m happier and that’s all that counts! Also, I must admit that since I started exercising, I sleep less (my 6 to 8 hours of sleep are enough now), I feel energetic, I work better, focus longer, I train harder. In fact, now I can hold a very busy schedule, I need less sleep and rest, and above all I still have energy to go out and catch-up with my friends after a long day. La belle vie! Modern training whether classes or bodybuilding (and yes, girls can do bodybuilding without bulking up!) are based on functional moves that mimic our daily activities. Such exercises work on each and every muscle in the body, facilitating daily tasks, and making daily activities easier and less tiring! The more I train, the more muscles I build (that will be a whole other post that Jeff will guide me through). And the more muscles I build, the more fat I burn. And the more fat I burn, the more I can eat without gaining weight. Not exactly but you know where I am going here right? Chocolate! I train for the love of chocolate! I personally believe that the first impression counts and the first impression is mostly based on what a person looks like. I do not call everyone to work on his physical appearance and run for the beauty pageant but there is nothing more repulsing than looking round and chubby at 30 in 2015. Hate me all you want but if you do not have a health issue, then you have no excuse to be round! Unconsciously, when I hit the gym, I start eating healthier. It is like I want to preserve all the effort I have done at the gym and do not want to waste the result my training will be getting me. As such, the combination between exercising and eating healthy helps me reach points 6 and 7 above faster… which can lead me to tolerate more cheat meals and thus…. More chocolate! Who does not like to feel strong? Guys crave it. Girls dream of it. I dreamt of it… until I lifted the first 80 kgs on the Leg Press the first time. Then I started craving it, wanting to lift more and do more reps. One more. A new record to break! What a good feeling! Attending courses, joining classes, reaching on time, respecting your coach, following instructions on exercises and reps… it feels like “good-old” school days again but hey! With the lifestyle we follow and the lack of organization I have, exercising sure helped me boost my sense of discipline! Socializing has nothing to do with adding new friends to your close circle. But for a people’s person like me, seeing new faces every day, chitchatting over a common area of interest (here being the gym, exercising and healthy dieting), learning from experience and sharing stories and anecdotes has never been more fulfilling. I can’t deny I have met interesting people who have added value to my work, my life and my friendships. Oh and my lovely coach with whom I will be collaborating on a training and health related blog post on monthly basis! Education has nothing to do with degrees. It all revolves about one’s thirst to learn about a certain subject and add this general knowledge. Since I started going to the gym regularly, I know more about exercises, classes, fitness, healthy dieting, proteins and vitamins, etc… It’s a whole new world and I still have a lot to learn but hey! At least I learned something new and benefit my mind not only my body. I woke up one morning with a terrible back ache. Too early to feel such morning pain in my early 30s, isn’t it? Moving out of bed, it was cold outside, my knees were hurting and I had no energy whatsoever to move. I felt sick. My bones were sick. My body was telling me something. Could it be the same thing my friend was telling me the other day? Could I be turning into an old lady a 30, starting to look like one, and starting to gain weight to an extent my body was hurt? Slapping myself back into reality, I registered myself at the gym later that day and started to exercise. Exercising felt good but I was not seeing any major changes, except some weight loss. So I started to obsess over sculpting my body. And this is when my friend put me in contact with Jeff, a trainer who started following-up with me with training techniques and dieting tips, helping me shred the fat that is too obvious to everyone who know me, gain confidence and above all, fall in love with weight training. During that time, and while I am no fitness guru, and I do not have a wide idea what fitness and perfect healthy dieting is about, my friends started mocking me for being fitness obsessed and a gym addict. In fact, I would easily cancel and/or delay plans because I cannot miss my training! Training became part of my routine; just like going to work, doing my nails, catching-up with the girls, going to the beach, etc… on my to-do-list, there was training.